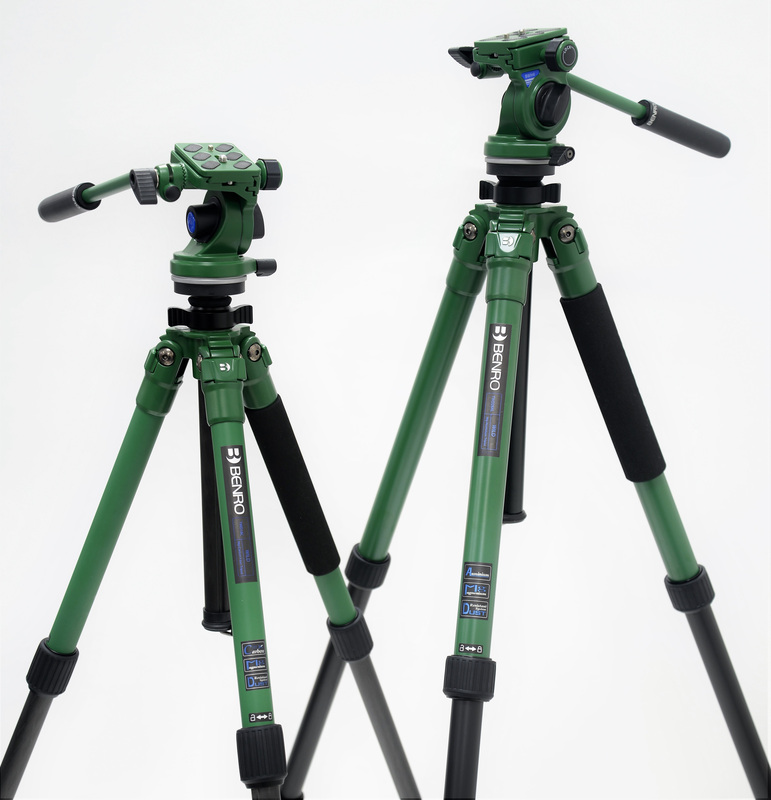 Revealed for the first time to visitors en masse at Birdfair 2018, Benro’s new Wild tripods have been designed principally for the birding and nature observation market. There are four kits available in the range, all using the same Benro BWH4 pan-and-tilt head which are mounted on versions of the company’s award-winning Mach3 tripods. 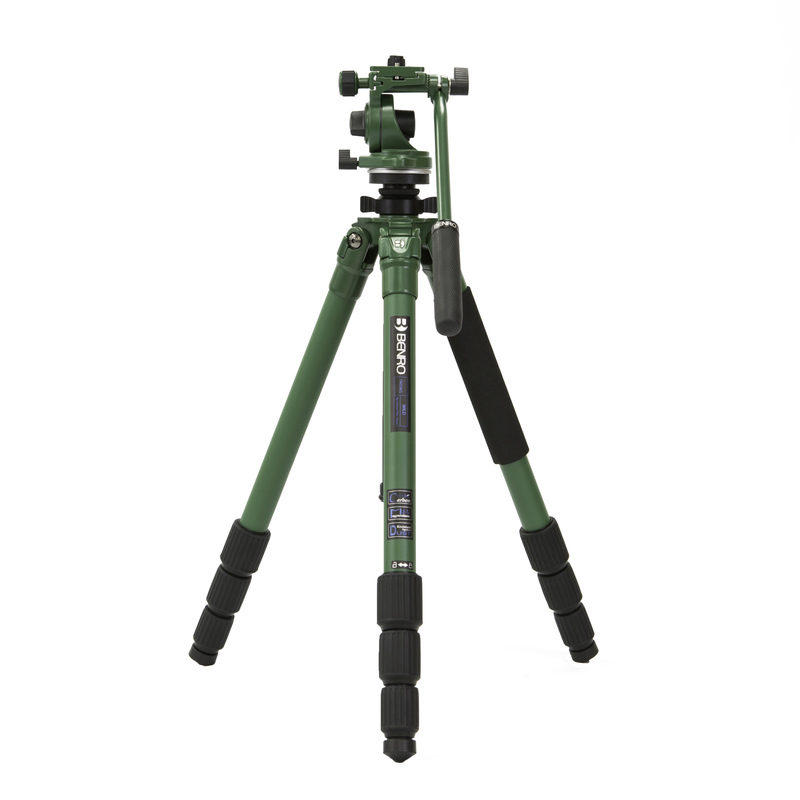 Two sizes of tripod are available in either aluminium or carbon fibre and all have four leg sections, designed so they fold to a compact size for portability. Being relatively tall, I opted to trial the large Wild 2 carbon fibre model, which meant I would not have to extend the centre column to use it with a scope. Out of the box, with the top leg sections finished in smart fern green, it looks impressive, feels light and exudes quality. The three lower leg sections are carbon fibre, while the uppers are a magnesium-based alloy, one of which is covered in a durable foam sleeve. I would liked to have seen a second leg featuring the sleeve as it increases the comfort factor when the tipod is carried over the shoulder. With the legs fully extended I found it sturdy and more than adequately supportive of my 80 mm scope. Over several weeks of testing, the apical leg hinges did not work loose, although should this happen, they are easily retensioned with an Allen key. I have always preferred leg lever-locks over and above twist-locks, principally because they are quicker to operate. However, I was impressed with the Wild’s grippy, rubber-milled twist-locks. The leg sections glide out effortlessly after just a quarter turn of each lock. The locks have a built-in anti-collapse mechanism. Twist the lock once to loosen and then again to release. As well as being quick, this mechanism prevents accidental retraction of extended legs, should any of the locks become accidentally loosened. The ‘business end’ of the kit is the BWH4 head, which supports a maximum equipment weight of 4 kg. Its design is based on the Arca-Swiss quick release (QR) system, using a QR plate, which has a 45° cross-sectional dovetail, 38 mm wide and held in place on the head by a simple screw clamp. The clamp can be fully opened, allowing the plate to be dropped in and secured, or it can be partially opened to allow the plate to be slid into position on the head. The biggest advantage of the Arca-Swiss system is this ability to slide the QR plate, allowing your scope (or camera) to be moved across the head and secured in a specific position using the screw clamp, which is operated by a small knob mounted on the side of the head. Sliding allows the centre of gravity to be changed when the scope is used with a camera for digiscoping. To prevent the plate sliding out completely if the clamp gets loosened, grooves form part of the plate’s docking station on the head and small screws are added to each end of the plate. These limit the movement of the plate to within the grooves, preventing a complete disconnect and possible equipment damage as a result. The standard QR plate supplied with the BWH4 head is relatively small and light and has a VHS anti-rotation pin, which also helps with alignment. This fixed-position pin is mounted within the plate on a spring clip, which is a neat idea to keep the pin in place in the tripod foot, saving the trouble of having to slide it into position and screw it in. Benro has also adopted a ‘belt and braces’ approach to the design of the branded ¼-inch plate attachment screw. It can be tightened or unscrewed between thumb and forefinger via a pivotal half-ring, a flat-blade screwdriver or using an Allen key. I like the attention to detail in the provision of these options. However, this standard plate is limited in the distance it can slide to a maximum of 15 mm beyond each end of the 60 mm-long head. While I found it helped with balancing the scope, it was pushed to the limit when adding a compact digital camera and adapter to the scope’s eyepiece. This was redressed by using Benro’s equally compatible PU100 QR plate. Weighing only 8 g more, it is longer but has a narrower top and can slide to a maximum of 53 mm beyond each end of the head. It is worth mentioning that many, but not all, manufacturers’ Arca-Swiss plates can be used with the Benro BWH4 head. Furthermore, in a move away from fitting Manfrotto-style tripod mounting feet, all new Swarovski scopes are now being fitted with Arca-Swiss-style feet, similarly eliminating the need for a QR plate but adding ‘slideability’ to the balancing equation. It will be interesting to see if other optics manufacturers follow suit. Providing the requisite amount of resistance in terms of manoeuvrability, the fluid head operates extremely smoothly in both pan and tilt modes. It is not spring loaded, which means it does not automatically return to the horizontal position when not in operation. This is an excellent birding tripod, particularly if used with the extended PU100 QR plate, which adds versatility if you are digiscoping. Prices range from £150 for the smaller Wild 1 aluminium kit, up to £340 for the Wild 2 carbon fibre kit and all are supplied with a padded carry bag, a set of spiked feet and a tool kit. The optional extra PU100 QR plate is an additional £24.